Rodney Stuckey seemed on the verge of stardom as a rookie, when he was at times the Pistons’ best player during the 2008 playoff run that ended in the conference finals against eventual champion Boston. For a stretch that lasted more than a month in his first year under Lawrence Frank, he appeared on the cusp of All-Star status, carrying the offense as both an efficient scorer and facilitator. Now playing for his fifth head coach as he enters his seventh season, Stuckey could be coming to a career crossroads. Still young enough, at 27, to have his best years ahead of him, and entering the last year of a three-year deal he signed with the Pistons coming out of the 2011 lockout, Stuckey could be the key piece in a lineup that figures to include four dynamic players around him in young holdovers Andre Drummond and Greg Monroe and high-wattage newcomers Josh Smith and Brandon Jennings. Inconsistency has dogged him over his first six seasons, but Pistons brass is openly optimistic that Stuckey is due for a productive season. Flexibility: Stuckey has spent the bulk of his career at point guard, though not as much in the past two seasons with the addition of Brandon Knight in the 2011 draft. He also has the size and strength to effectively match up with many small forwards. Caldwell-Pope probably plays nothing but shooting guard initially.. The skinny: The only real starting job with a degree of uncertainty headed to training camp is this one. Stuckey is the safest bet – and probably winds up playing the most minutes at shooting guard – but might he fit better as a go-to scorer with the second unit? And, if so, is Caldwell-Pope ready to play at least nominal starter’s minutes? Stuckey’s scoring average and minutes have dropped for four straight seasons, from career bests of 16.6 and 34.2 for the undermanned 2009-10 Pistons to 11.5 and 29 last season. He spent the off-season focused on becoming even stronger – already one of his biggest advantages – and will come to camp in the best shape of his career. A constant among the coaches he’s answered to over his Pistons tenure is their belief that Stuckey is at his best when he is in attack mode. The composition of the roster this year might make it easier for him to consistently do so. Maurice Cheeks, lauded in past stops for his ability to draw out the best in young players, has reached out to Stuckey when they’ve crossed paths this summer to encourage Stuckey to take a leadership stake in the Pistons. That force field of positive energy Stuckey has exuded this summer has struck those who’ve been around him throughout his NBA career. While Stuckey might be the frontrunner at the position, Cheeks will have options. Chauncey Billups made it clear that he still views himself as a point guard, despite playing shooting guard the past two years alongside Chris Paul in Los Angeles, and his shooting stroke and big-game aplomb will make him a strong candidate to be on the floor in some capacity in the final moments of undecided games. Kyle Singler started at shooting guard from the season’s ninth game until the late-January trade that shipped Tayshaun Prince to Memphis necessitated his shifting to small forward. Long term, the Pistons feel strongly that lottery pick Kentavious Caldwell-Pope will be the answer at shooting guard. A strong second half of his sophomore season at Georgia compelled him to enter the NBA draft, where he went from a projected late first-rounder to the No. 8 pick as scouts delved more into his body of work. 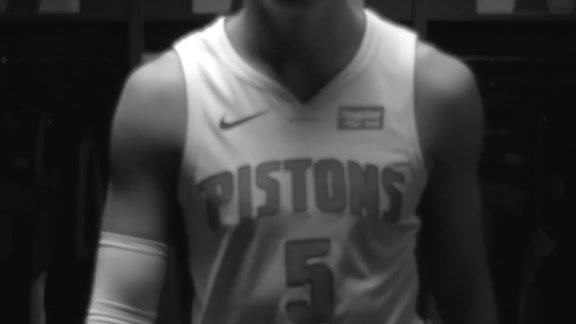 Most rookies need time to grow comfortable with the longer 3-point shot and speed of defenders to become effective deep shooters, but Caldwell-Pope showed the Pistons in Summer League that he’s capable of contributing in areas beyond 3-point shooting. Caldwell-Pope’s long wing span and quick hands and feet stamped him as a disruptive defender in the glimpses the Pistons saw of him in Summer League, where he recovered from a dreadful shooting debut – 1 of 14 from the 3-point line in his first two games – to finish with a rush. Over the last three games, Caldwell-Pope averaged 18 points and got to the foul line 19 times, showing eye-opening ability to get to the rim and explode over defenders. As much as anything, what the Pistons love about Caldwell-Pope is how hard he consistently plays. The Pistons are confident Caldwell-Pope will eventually show the 3-point stroke that made him an offensive force at Georgia and that he’ll offer enough in other areas to challenge for playing time as a rookie.